Learn More Here is a short tour! When you login you are first presented with your Dashboard. The Dashboard will be like your Central Office. From here you will be able to get a quick view of “Who’s Due”. You will also be able to input new breedings , and quickly email pedigrees to customers. 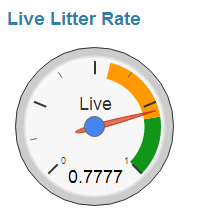 There is also a graphical view for you Conception Rate and your average Live Litter Rate. Sell an animal and drop the pedigree in the customers Inbox before they walk away. 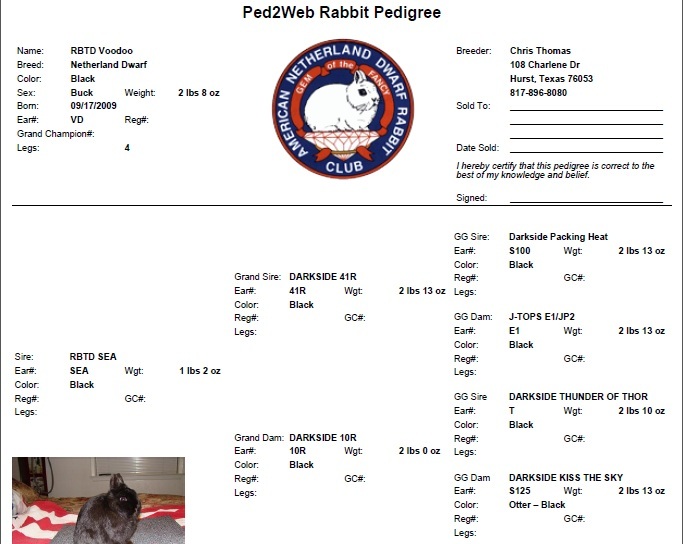 Our pedigrees are sent as a pdf document with a picture of the animal. The pedigrees include legs won, registration number, and grand champion number. Impress everyone with the clean and easy to read format. We offer three different formats of pedigre picture placement. You can even set the pedigree to use your own logo. 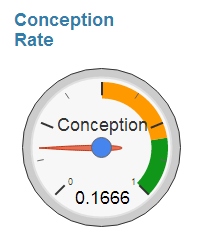 Our Conception Rate Calculator tracks the progress of your breeding program. With our ongoing reporting system, analyze your data over a long period of time. This feature give you a running total of the average litter size for the calendar year. This is the meat and potatoes of the application. This is where you input your animals into the system. We encourage everyone to read their pedigrees carefully when transferring the information to the system. Your data is only as accurate as what you put in the system. Notice the tabbed interface and all the information tracked on each animal. Also, you can easily navigate between animals. What better way to help market your animals than some great looking pictures of your animals. Our system allows you to upload 6 pictures per animal. Choose a cover picture which will display on your auto generated pedigree. All pictures are visible on your for sale listings. Our comprehensive breeding management system tracks everything about your breedings. It is intuitive and easy to use! 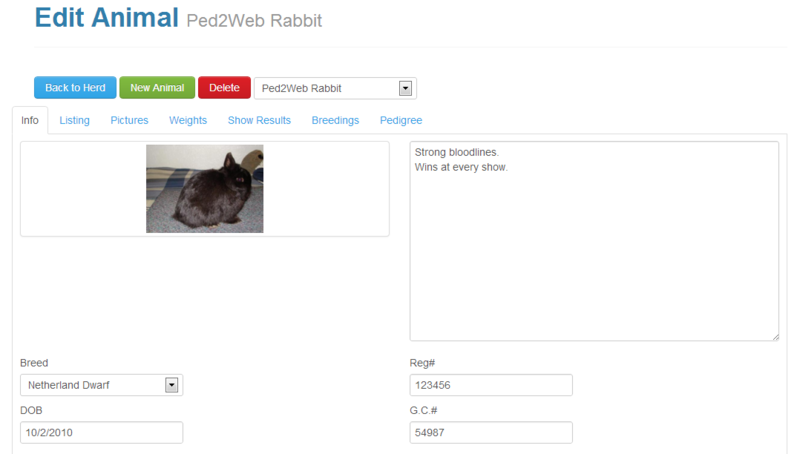 If you are a commercial breeder or just enjoy breeding rabbits this system is for you! Never forget about a breeding. Our settings page allows you to receive emails reminders for due dates and nest box notifications. You have the ability to set when you want to be notified. The system tracks the animals bred. You can enter a due date, breeding date, palpated date, indicate if a nestbox has been setup, mark if the breeding was a miss, and set a date kindled. The dashboard notifies shows who is due as soon as you log in. You can even update the breeding from the dashboard. With the live litter rate and conception rate you always know your breeding quality. After the animal has birthed the offspring you can track the live and dead offspring. You can enter the live offspring into litter management and the animals are automatically added to your herd. Even better, the lineage is added for each animal and the pedigree is imediately available. Litter management allows you to see all animals related to the breeding. Track your animal's growth. 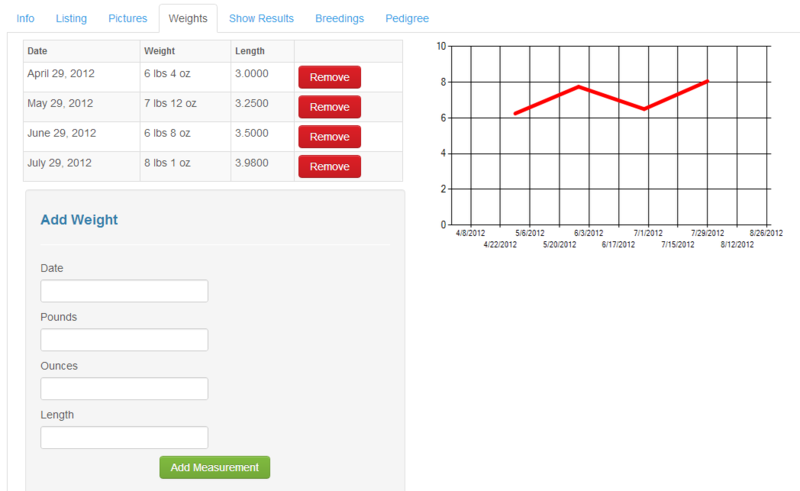 You can input an animal's weight and ear length at any interval you choose. After each entry you see a grapical representation of the animal's growth! Your subscription includes the ability to list your animals for sale. Listings run for 30 days and can be renewed or discontinued at anytime. Just set an asking price and a short description and press list! Thats all it takes the site does the rest. Viewers will have the option to send you a message. They can request a purchase or ask for more informatiom. The only catch you handle the transaction from there. Listings are randomly featured on our home page. You can also view have how many times your listing has been viewed! Your data is safe! Your connection is secure. All data is backed up nightly! Never worry about a loss of data even if your computer has trouble. We are mobile compliant. Ped2Web renders on any mobile device including phones and tablets. The beauty of our system is to have all of your rabbitry management needs at your fingertips. We have plans and more plans! We will be adding new features on a regular basis. The new features come at no cost to you! If you are a full subscriber the updates are yours to use!